Masters of Spell and Sword! While many legendary heroes of Golarion fit easily into the core classes of the Pathfinder Roleplaying Game - the sword-swinging fighters, fireball-flinging wizards, backstabbing rogues, and others - there are some who specialize in unique styles and techniques, perfectly customizing themselves for their roles. For these characters, there are prestige classes. From the undead-hunting Knights of Ozem to the revolutionary Gray Gardeners of Galt, this book collects 30 of the most prominent faiths and factions from around the Inner Sea and transforms them into prestige classes designed to help you take advantage of the tricks and tactics of some of Golarion's most famous (and infamous) groups, all while rooting your character firmly in the lore and societies of the Pathfinder campaign setting. The Aldori swordlord, world-renowned dueling master of the turbulent north. The Hellknight signifier, an armoured spellcaster who uses magic to pursue the perfect, iron-fisted law of Hell. The gun-toting shieldmarshal, whose bright badge brings order to the chaos of the Mana Wastes. The mammoth rider, savage megafauna cavalry expert. The Sleepless detective, uniquely suited to solving mysteries both magical and mundane in haunted Ustalav. The winter witch, whose ice magic keeps a whole nation in thrall. 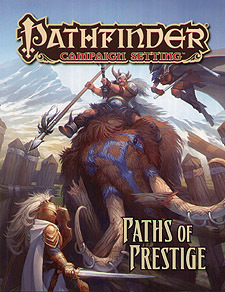 Paths of Prestige is intended for use with the Pathfinder Roleplaying Game and the Pathfinder campaign setting, but can easily be used in any fantasy game setting.